Ever since Darwin first set foot on the Galapagos, evolutionary biologists have long known that the geographic isolation of archipelogos has helped spur the formation of new species. Now, an international research team led by Theresa Cole at the University of Otago, New Zealand, has found the same holds true for penguins. They have found the first compelling evidence that modern penguin diversity is driven by islands, despite spending the majority of their lives at sea. "We propose that this diversification pulse was tied to the emergence of islands, which created new opportunities for isolation and speciation," said Cole. Over the last 5 million years, during the Miocene period, (particularly within the last 2 million years), island emergence in the Southern Hemisphere has driven several branches on the penguin evolutionary tree, and also drove the more recent influence of human-caused extinctions of two recently extinct penguin species from New Zealand's Chatham Islands. "Our findings suggest that these taxa were extirpated shortly after human settlement on the Chatham Islands," said Cole. "These findings thus potentially represent important new examples of human-driven, Holocene extinction in the Pacific." "While our results reinforce the importance of islands in generating biodiversity, they also underscore the role of humans as agents of biodiversity loss, especially via the extinction of island-endemic taxa," said Cole. As many of the bones were from middens, our results provide direct evidence that our newly discovered extinct taxa was hunted by humans." The publication appears in the advanced online edition of the journal Molecular Biology and Evolution. About 20 modern penguin species exist, from the Antarctic emperor penguin, the forest dwelling Fiordland penguin and the tropical Galapagos penguin. A fossil record of more than 50 species can trace back penguin history to more than 60 million years ago—indicating that penguin diversity may have once been much higher than today. Using historical skin samples and subfossils from natural history museums, along with blood samples, the researchers performed the largest survey to date, across all penguin taxa. The team tested their island hypotheses using 41 near-complete mitochondrial genomes, representing all extant and recently extinct penguin taxa. They calibrated their mitogenomic evolution to make an evolutionary clock based on the fossil record. "By using well-justified fossil calibrations, we resolve the timing and mechanisms of modern penguin diversification," said Cole. They found that the two largest-bodied and most polar-adapted penguins are sister to all other living penguins. 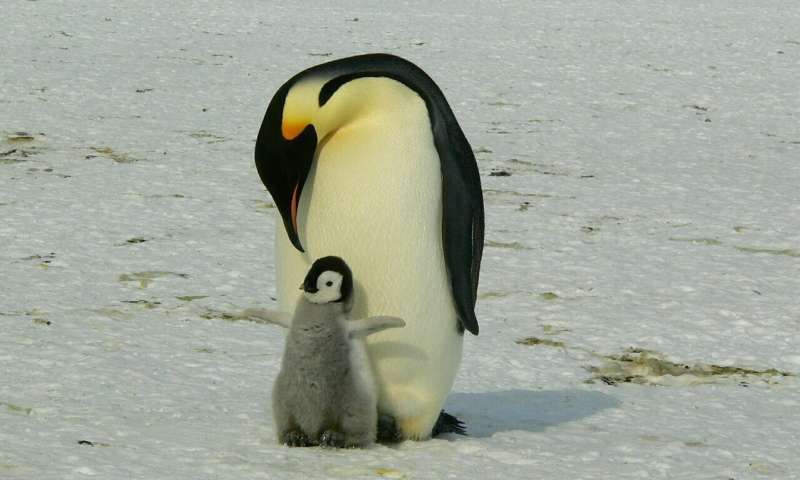 The DNA evidence also showed that genetically similar penguin species may be at the earlies stages of diversification. The study provides important new data and perspectives to the debate on the origins of penguin diversity. It will also help better understand the role of islands as drivers of speciation to other animals and marine life. The new taxa have been named Eudyptes warhami and Megadyptes antipodes richdalei after John Warham and Lance Richdale, pioneers in penguin biology.